This review is dedicated to my Aunt Sylvie Hyde, who is actually from the city of Orléans, France. Orléans is a game by Reiner Stockhausen, published by Tasty Minstrel Games. It is for 2-4 players. 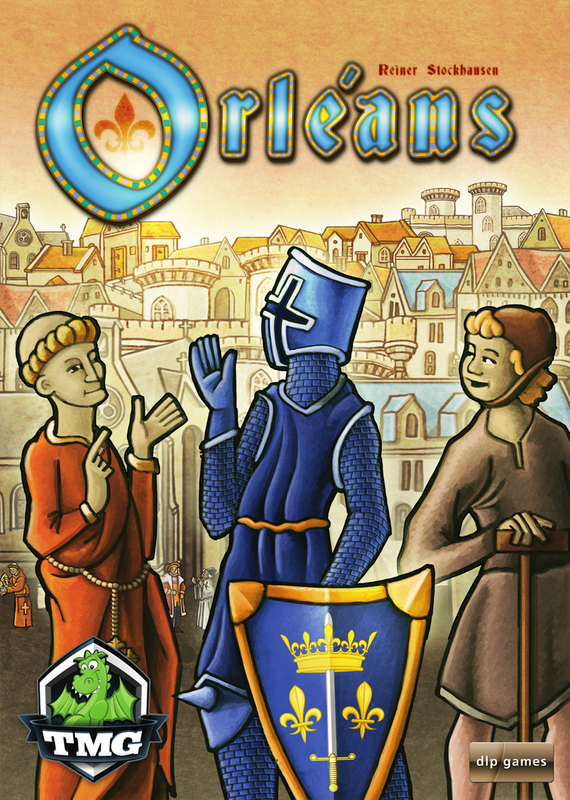 In this game, players will be trying to gain the majority in several different areas around the medieval French town of Orléans. They will need to gain the help of farmers, craftsmen, boatmen and traders, as well as scholars, knights and monks. They’ll also need goods from their merchant. In the end, the player that can acquire the most coins, goods and other necessities, will be declared the winner. To begin, each player chooses a color and is given a follower bag, wooden markers, a merchant token, trading stations and a set of followers in their chosen color. 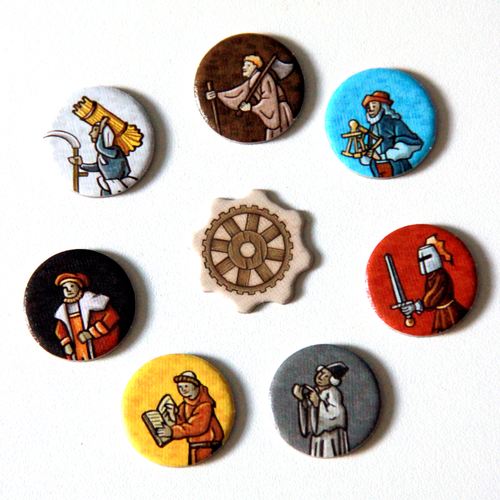 They are also given a player board and 5 coins. Each player places their trading stations in front of them along with their player board. They then place their followers onto the market space of their player board. The game board along with the Beneficial Deeds board are both placed in the middle of the play area. The technology tiles are placed on the matching space on the board. The Pilgrimage tile is removed from the deck of Hour Glass tiles. The remaining tiles are then shuffled and placed face down on the corresponding space on the board. The Pilgrimage tile is then placed on top of the stack. Each player places one of their markers on the first space of each of the Character tracks on the board. They also place one on the Development Track. The neutral Character tiles are all sorted by type and then placed on the corresponding locations on the board. The coins are placed near the board within reach of all players. The Citizen tiles are placed on the corresponding space on the board and the Beneficial Deeds board. One remaining tile will be placed near the board for end game scoring. The Place Tiles are sorted by the Roman Numeral on the back side. They are then stacked into 2 separate piles beside the board with the Roman Numeral side face up. The Goods Tiles are shuffled face down on the table before being randomly placed face up on the road and waterway spaces. If playing with fewer than 4 players, some tiles will be removed from the game. It should be noted that some neutral characters will also be removed from the game if less than 4 players are playing. Any remaining Goods Tiles are then placed on the corresponding spaces on the board. Each player places their Merchant Token on Orléans on the map side of the board. The first player is chosen and is given the Start Player Token. Play now begins. The game is played over 18 rounds. Each round is composed of 7 phases; hour glass, census, followers, planning, actions, event and start player. The first phase is the Hour Glass phase. In this phase, the first player draws the top tile of the Hour Glass stack and places it face up beside the stack. This reveals the event that players will have to deal with in phase 6. Since the Pilgrimage tile is the first tile, it is the only tile that is dealt with during the 5th phase instead of in phase 6. It keeps players from recruiting monks. The second phase is the Census phase. In this phase, players determine who has the most and who has the least farmers by checking the player markers on the Farmer’s track. The player whose marker is furthest to the right receives a coin from the supply, while the player farthest to the left must pay a coin to the supply. In cases of a tie, no coins are payed or received. In a 2 player game, the person ahead receives a coin, but the person behind doesn’t have to pay. The third phase is the Followers phase. In this phase, players may draw character tiles from their Followers bag and place them on the Market of their player board. The number of tiles drawn is equal to the number indicated by the player’s marker on the Knights track. The fourth phase is the Planning phase. In this phase, players are able to use the character tiles that are on the Market of their player board to activate actions from different locations on their boards. Once all the required tiles have been placed on a certain spot, the spaces is considered activated. The player is then able to carry out the action during the Action phase or during a future Action phase. We’ll discuss these actions in a bit more detail in just a moment. It should be noted that players do not have to place all the required tiles on a spot in the same Planning phase. They are able to place some at this time and may complete the requirements in later rounds. The fifth phase is the Actions phase. In this phase, players are able to now carry out any actions that they fulfilled all the requirements for during the previous phase or in previous rounds. Once the player has completed the action, they remove the followers from the space and return them to their Follower bag. Players are also allowed to pass if they can not or do not want to take any actions. Once a player passes they are not allowed to participate in the current Action phase any longer. Once all players have passed, play moves into the next phase. It should be noted that any Technology tiles on a spot are not removed and must remain on the space until the end of the game. At this time, I’ll explain the common locations found on a player’s board. Of course there are more locations that may be acquired during the game, this is simply the main actions. There’s the Farm House. This location allows the player to take a Farmer tile and place it into their bag. They then advance their marker 1 space forward on the Farmers track. They then receive the good shown on the space. The Village allows a player to gain either a Boatman, Craftsman or Trader. If the Boatman is chosen, the player places a Boatman tile into their bag and advances their marker 1 space on the Boatman track. They then receive the amount of coins shown on the space. The first player to reach the end of the track receives a Citizen tile. If the Craftsman is chosen, the player places a Craftsman tile in their bag and moves their marker 1 space forward on the Craftsman track. They then receive a Technology tile which is set beside their player board. It may only be used after the player passes. I’ll explain how these work in a moment. If the Trader is chosen, the player places a Trader tile into their bag and advances their marker 1 space on the Traders track. They are then able to expand their city by choosing a place tile from the stack of tiles. The first time the player advances on this track they are only allowed to choose from Stack I. The next time they advance, they can choose from either Stack I or Stack II. The new location is placed next to the player’s board and gives them a new location to take actions on. The University is another location. This location allows the player to take a Scholar tile and place it into their bag. They then advance their marker on the Scholars track. They then gain the corresponding number of Development Points. Each point allows the player to move their marker 1 space on the Development Track. The Castle is another location. This one allows the player to take a Knight tile and place it into their bag. They then advance their marker 1 space on the Knights track. This track shows how many followers a player is allowed to draw from their bag during the Followers phase. The first person to get to the Citizen tile on the track receives it. The Monastery is a location that allows a player to take a Monk tile and place it into their bag. They are able to use the Monk tile in the place of any other tile. The ship location allows a player to move their Merchant token along a Waterway to an adjacent town. Any goods tile they cross along the way is taken by the player. If there are multiple goods, they are only able to take 1. These tiles are then placed beside the player’s board. The Wagon location is exactly the same as the ship action, except the player moves their Merchant token along the Road instead. The Guildhall allows a player to build a Trading Station in the town where their Merchant token is located, as long as there are no other Trading Stations already there. However, Orléans is the exception to this rule, as each player may build a Trading Station there. The Scriptorium allows a player to receive a development point, moving their marker 1 space on the Development Track. The Town Hall allows the player to place any type of character tile here during the Planning phase. It’s activated with either 1 or 2 tiles on it. The player is then able to move one or both tiles onto a free space on the Beneficial Deeds board. They then gain the corresponding reward shown on the board. In most cases this is a number of coins or in some cases can be a Development point. Each character tile placed gains the reward. Whicever player places the last character tile to complete a Beneficial Deed, gains the Citizen tile related to it. It should be noted that monks may not be used to replace Character tiles on this particular board. The exact tiles must be used. The sixth phase is the Event phase. In this phase the current Event shown on the Hour Glass Tile for the round is resolved. This could be something beneficial like gaining a coin for each Trading Station the player has built, or it could be something negative like losing a Character tile from the Followers bag. It should be noted that if a player can not pay something that they owe, they are required to undergo torture. What that means is that they have to replace every missing coin that they were required to pay with either a Trading Station, follower, Development Point, goods tile, place tile or Technology tiles. These items are then removed from the game and may not be used. The final phase is the Start Player phase. In this phase, the player with the Start Player token passes it to the player to their left. That player then becomes the first player for the next round. Several times I’ve mentioned the Development Track. This track indicates the player’s state of development. As they move forward on this track they may move onto spaces that contain coins or even Citizen Tiles. Each time a player’s marker moves onto the corresponding spot, they take the indicated reward. Some events will be affected by the player’s status on this track, especially the Income event. The game continues until the end of the 18th round. Before players score their points, the remaining Citizen tile is given to the player with the most Trading Stations. Players then add up their scores, gaining points for coins, goods, Trading Stations and Citizen Tiles they have. Players then compare scores and the one with the most victory points is the winner. This game comes with some really great looking pieces. To start off, you’ve got a really nice looking game board. The map is on one side and the tracks are all on the other. Not really sure why they tilted the map image on the board to make it look off kilter but it’s fine. Next there’s the smaller Beneficial Deeds board and the player boards. These are made of thick cardboard and are really good quality. The iconography is pretty easy to understand so it shouldn’t cause a lot of problems for most players. There a plenty of wood bits too. There are player markers, trading stations and merchant tokens in 4 different colors, 1 color for each player. This game has a ton of cardboard which makes up almost all the rest of the pieces. There are character tiles, goods tiles, technology tiles, citizen tiles, coins, building tiles, event tiles, overview tiles and a start player tile. That’s a lot of cardboard. I really like the artwork and how the different pieces compliment each other. It really makes it feel like a very cohesive game. I especially like the character tiles and the building tiles. The characters all correspond with the different tracks on the left side of the board. I like the designs for each one and how you get a real feel of having these people come and work for you. The building tiles compliment the player boards. Each of these has that same style of design with the action to take at the top with the workers needed to take the action at the bottom. All this is placed on top of a thematic looking background that works with the building type. The final pieces are the velvety smooth follower bags. These are super nice and are in the 4 different player colors. Overall, I can’t say enough good things about the design here. The only thing that could make this game better is if it had the special components contained in the Deluxe game. For what you get though, this game looks beautiful and is chocked full of goodness. The rulebook for this one is really well thought out and designed great. The setup is easy to follow and has plenty of great pictures to aid you with. The book itself has lots of pictures throughout as well as some great examples of gameplay too. Each step and phase of the game are well detailed and explained superbly. There should be nothing difficult to understand at all. I especially like that the different actions and places are explained so well. There are even sections devoted to the different events and the place tiles as well. Each of these are also explained in great detail. Overall, I really like the design and look of the rulebook. It really exceeded my expectations and it didn’t take a very long time to read through. Can’t complain about that. This is an absolutely phenomenal game. I love the worker placement aspect of it. I like how that each time you gain a new follower, you also move on the corresponding track, which gives you more stuff to be able to do even more with. I like the blind bag drawing. Sure it’s a bit luck oriented but if you’re thinking about what you’re putting in there and what’s still left in the bag, you’ll pretty much get what you want out of it. It’s kind of like counting cards but in this case, you’re counting followers instead. I like the city building aspect as well. I like having new places that I can use to build up my city and increase my productivity with. This aspect gives me a bit of an engine building mechanic feel to the game. Each action you take helps you to add more things to make your workers even more effective. The events are also a nice touch and can either be very beneficial or sometimes even detrimental to your productivity. Another aspect of the events is that they also keep the time of the game. Once they’re gone, the game’s over. For me, there’s really a lot to like here, especially since I like worker placement games. This is one that does it with style. I will also say that there’s a ton of options and decisions to make. So much so that you’ll find yourself wishing that you had more followers to be able to do even more stuff with. I like the medieval style theme of the game. For me it fits in well with games like Lords of Waterdeep, and makes a natural evolution for a bit more challenge. Not necessarily more difficult, just more to do. Fans of games like Lords of Waterdeep or Yedo, should really enjoy the worker placement aspects of the game. This is a game that I would highly recommend. If you haven’t tried it, you owe it to yourself to play it. I guarantee you won’t be disappointed. Orléans is a worker placement style game with a medieval theme to it. It’s a fairly average length game. Most game sessions last around an hour and a half to an hour and 45 minutes. The components are all really nice. I especially like the art style of the different characters, board and places. Everything fits really well together thematically and looks great. I kind of wish that there was a bit more wood pieces with the game, such as are found in the Deluxe edition of the game. However, I’m not complaining because you actually get quite a lot inside the box. The rulebook is extremely well done and is super easy to read through. There should be nothing here that would be difficult to understand. The game is extremely fun, especially for fans of worker placement games. Fans of games like Lords of Waterdeep or Yedo should especially enjoy this one. Even Euro fans like those for Agricola or Caverna might enjoy this one a lot to. This is a game that I highly recommend. If you only get one thing from this review, get this, “BUY THIS GAME!” You will not be disappointed. It’s absolutely gorgeous and a ton of fun, just like my Aunt Sylvie. This entry was posted in Reviews and tagged board, board games, card, card games, games, minstrel, Orléans, reiner, reiner stockhausen, stockhausen, tasty, tasty minstrel games, tmg. Bookmark the permalink.